You can check out my Pirate Themed Finds here! 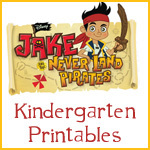 Will you leave links to your PIRATE themed printables or ideas in the comments section? I’d love to check your ideas out too! Montessori Minute ~ Where Do I Start?